After the Boston Massacre in 1770, tensions were high in Boston. The British Parliament passed a tax on tea to the colonies. Such revenue acts were considered by the colonists as "taxation without representation," and by 1773 many considered the British as oppressors. Word reached the town that ships of the East India Company were heading for Boston. Meetings were held clandestinely at the Liberty Tree. Hand bills were posted in the streets, warning the recipients not to land the tea. Great meetings were held at Faneuil Hall and the Old South Meeting House, and it was resolved the tea would not be allowed to land. 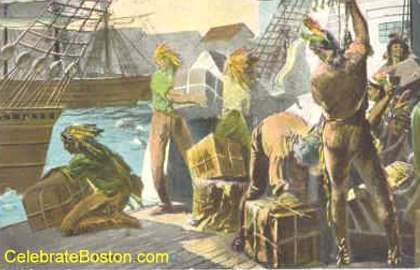 The first ship, Dartmouth, arrived in Boston on November 28th 1773. "Quaker" Rotch, owner of the ship, was brought to the meetings. He was instructed not to land the tea, and to have the ship sail back from whence it came. Legal recipients of the tea shipment decided to ignore warnings from the public meetings. The two other ships, Eleanor and Beaver, soon arrived, and the three ships were anchored at Griffin's Wharf. By law, the Dartmouth had to unload its cargo within 20 days, and on December 16th, the deadline expired. At the great meeting at the Old South that day and evening, Rotch informed the participants that Governor Hutchinson denied clearance for the Dartmouth to sail from Boston. Samuel Adams remarked, "This meeting can do nothing more to save the country." The Boston Tea Party ended a grave crisis without bloodshed. During the 20 days Dartmouth was in port, the situation could have easily erupted into armed conflict. Actions by the band of "Mohawks" were quite orchestrated, and the event appeared to be carefully pre-planned. The Boston Tea Party sent a blunt message to Britain that the time for rebellion was quickly approaching. Paul Revere, Samuel Sprague, and likely Joseph Warren, were participants in the Boston Tea Party. 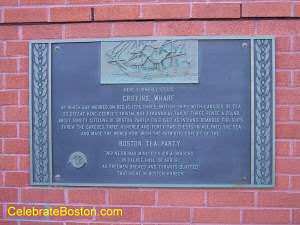 A memorial plaque is located at the foot of the Evelyn Moakley Bridge at Atlantic Avenue and Seaport Boulevard. Just before crossing over to the Seaport District, the plaque is mounted on the building on the right side of the street. Griffin's Wharf was in reality located about 500 feet or so west of this marker, as this area was reclaimed from a mud flat when Fort Hill was cut down for landfill.